1.2.1 I’m a carpenter so if you are like me and work inside and in dry conditions you will not need 100% waterproof boots as your feet are just going to sweat and be uncomfortable during the day. 1.2.2 There are times when you need to work out side in the mud and rain where you do need your foot where to deal with the wet conditions. A good comfortable pair of water- resistant work boots are going to be the best choice. 1.3 Can I Waterproof My Own Work Boots? 1.4 How to waterproof your work boots using pastes, creams or waxes? 1.7 The days of having to work in rubber waterproof work boots that fill up with sweat and become wet from sweat are over. 1.8 Here are the two options to decide which boots are best suited for you. Anyone who has ever had to endure work with wet work boots knows how important it is to keep your feet dry. Wet boots can be a game changer! Really bad times! There are a lot of jobs out there where you are going to be working in wet conditions, so it’s best to be prepared. Don’t take any chances and make sure you have the best waterproof work boots! I know you may be thinking why do my feet always get wet and smelly? Sounds like you need to invest in a pair of best waterproof work boots to keep your feet dry. The best waterproof work boots are usually made from rubber. There are 100% waterproof work boots used for difficult conditions such as mud, deep water, and concrete. There are also water resistant leather boots that will never be 100% waterproof but with the right treatment can become resistant to water meaning that it will be slowed down. Nobody wants to deal with wet feet but the reality is that some jobs deal with wet conditions from time to time or every day. 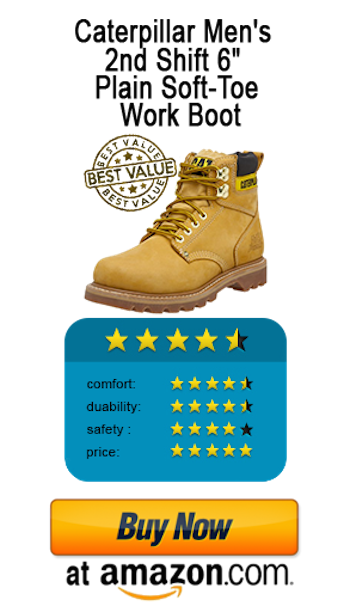 That’s why we have written this article to give reviews of the best rated waterproof work boots. I’m a carpenter so if you are like me and work inside and in dry conditions you will not need 100% waterproof boots as your feet are just going to sweat and be uncomfortable during the day. There are times when you need to work out side in the mud and rain where you do need your foot where to deal with the wet conditions. A good comfortable pair of water- resistant work boots are going to be the best choice. Can I Waterproof My Own Work Boots? How to waterproof your work boots using pastes, creams or waxes? This is a quick and easy way to add a bit of waterproofing to your work boots. Everyone seems to have a favorite product that they believe works best. They all aim for the same outcome so it’s just a personal preference. – Clean the work boots thoroughly. Feel free to use dishwashing liquid or use footwear cleaning cream. Give the boots a good scrub with a soft brush and rinse with clean water once you have finished. – Rub the wax, cream or paste in the boots using a rag or cloth using a circular motion. Make sure you apply to the seams also. – Once you have applied the product generously into the boots outside skin use a clean cloth to rub off any excess that is not needed. For years a lot of people have thought that to have a work boot that is really waterproof you need to be totally uncomfortable. This not the case today as workboot quality of construction has come a long way in comfort and quality design. The reason waterproof work boots have been uncomfortable in the past is because they have been made from old rubber. This old rubber was not a breathable material which resulted in the feet sweat A LOT. Comfortable work boots are generally made of leather. The problem is that leather and the joints will never be 100 % waterproof. Only water resistant. Rubber made today is still unbreathable yet the rubber waterproof work boots of today come lined with a breathable lining. Lining such as gore-tex is excellent for regulating heat and distributing moisture. The days of having to work in rubber waterproof work boots that fill up with sweat and become wet from sweat are over. Here are the two options to decide which boots are best suited for you. If you are more likely to be in the ‘A’ category then you should find yourself a good quality pair of 100% waterproof work boots. 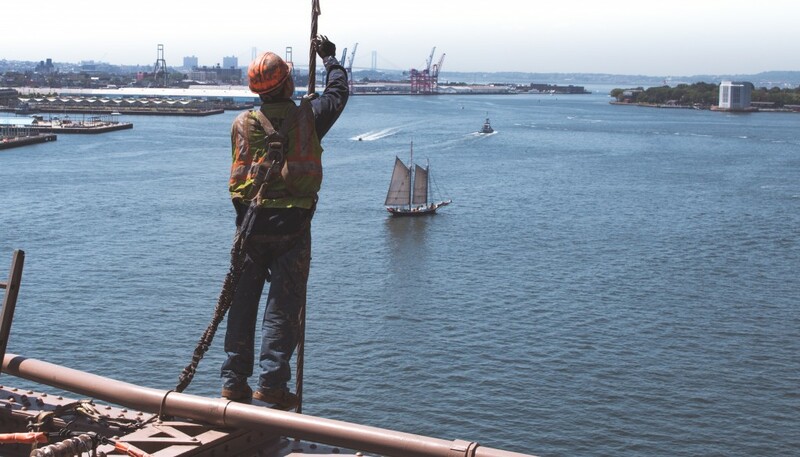 Make sure you invest in the best waterproof work boot that is available to make sure your feet will remain dry and be able to breathe throughout the day. If you are in more of a position like ‘A’ you will be suited to wearing a comfortable leather work boots. Most leather work boots on the market today are water resistant meaning that you can work in the rain or walk through a puddle or two and not be too worried about having wet feet. The best thing to do is use a waterproofing wax or cream to keep the boots as water resistant as the day you purchased them. Baffin, one of the best manufacturers of footwear products, combines the latest molding technology with a foam based inner boot system to produce the highest quality of footwear products that feature long lasting performance and perfect for any work environment. Perfectly built for agricultural works and for workers in rugged terrain, Baffin Men’s Tractor Industrial Rubber Boot protects your feet all day long. Probably one of the most dependable working boots for the agricultural sector, as it comes with several great features including waterproof for all weather application which helps keep your feet dry even when working in wet conditions. The boot is made of treaded outsole that is slip resistant, and to maintain a strong grip, great balance and secured footing while working on any terrain. 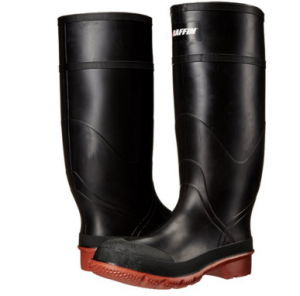 Manufactured in Canada using the finest materials, Baffin Men’s Tractor Industrial Rubber Boot is strong enough to withstand any work environment. Baffin boots are uniquely designed with pull on, making it easier for users to slip into it and remove without stress. This work boot is durable and offers a long-lasting performance. Baffin Men’s Tractor Industrial Rubber Boot is flexible and lightweight making it ideal for daily wear and it comes with the long-wearing self-cleaning outsole. 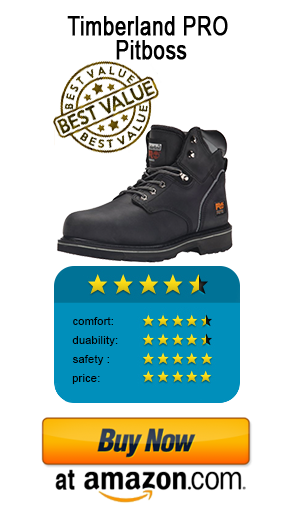 This work boot is affordable and offers superior comfort and warmth for users. The Original Muck Boot Company Chore Mid is perfectly designed for heavy duty and performs well on hard surfaces. Featuring stretch-fit topline and steel shank for extra support, this Chore Muck Boot is one of the best work boots you can find on the market today. This work boot offers additional stability and comfort while working all day long bending and standing for hours. This rugged work boot is also perfect for farm chores and other agricultural works. Featuring a contrast logo, waterproof shell, and flexible shaft, the Original Muck Boot Company Chore Mid is designed to offer long-lasting performance and work hard for you any time any day. This boot comes with a slip-resistant outer sole for good grip and breathable air mesh lining for additional comfort. The Chore Muck Boot is designed for all weather conditions and it comes with superior insulation to keep your feet warm and dry regardless of the weather. This work boot is flexible, and lightweight making it ideal for wear to work on a daily basis. The Original Muck Boot Company Chore Mid is extremely comfortable, perfect fit, warm, offers great cushioning and comes with quick clean rubber overlay. It is one of the top choices among outdoor men. Many people work in wet, muddy conditions. 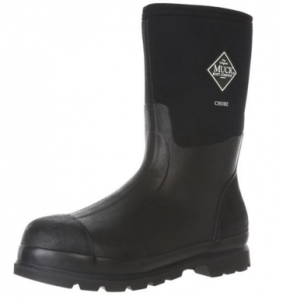 Waterproof boots are an absolute necessity to be comfortable working in damp and wet conditions. If you are one of those workers then these are the boots for you. These rugged Caterpillar work boots have got you covered in all types of we ather. You can work hard in wet conditions without having to worry about them letting water in. 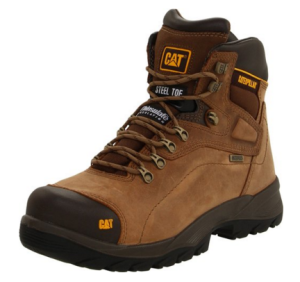 They are a really comfortable work boot Unlike many waterproof boots, these Cat boots are surprisingly breathable. So your feet won’t overheat every time you come in out of the rain. These excellent quality boots can be worn straight away all day without worrying about the uncomfortable break-in period that comes with a lot of boots. For me, they were comfortable from day one. They have good cushioning and your feet will feel good at the end of the day. The only thing I’m not pleased with when it comes to the fit is they do feel a bit wide at the ends. No boot is perfect and I’d say that the biggest setback in these boots is their weight. I’m not sure whether it’s the steel toe or their waterproof coating but they feel heavy, especially after a long days work. 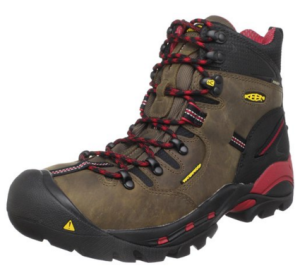 Check out our full detailed review of these epic Waterproof work boots! boot at all. At first glance, they appear to be more of a hiking type shoe than a hard-working boot. Don’t let them fool you. This is a rough, tough boot, with all the right boxes ticked off when it comes to safety and keeping your feet safe. Like their Tacoma boot, these feature an asymmetrical steel toe for safety. It’s topped off with a tough rubber toecap.These boots are very waterproof. Rest assured your feet will be protected. Plus, they are equipped with electrical hazard protection. The soles have aggressive treads that grab well and are resistant to oil, slips, and abrasion. This top work boot has been made from a strong textile material that. This not only makes for a more comfortable boot, it helps minimize foot fatigue over the course of a day. And it’s lightweight. Another feature I like about the Pittsburgh boots is they don’t just resemble great hiking boots, they are great hiking boots. These boots are great for a while list of activities on the weekends including hiking and hunting. They will keep your feet safe working too. Haven’t found what you’re looking for? Check out our full comparison guide here!